Analysis of chart patterns is still one of the most highly used strategies by traders to gauge future price direction. Specific patterns, when combined with other factors such as technical indicators, trading volume and macroeconomic releases, can provide high accuracy forecasts and good opportunities to trade. Patterns can fall into one of two categories; continuation patterns, i.e. patterns that signal that a trend will continue and reversal patterns, i.e. patterns that indicate the trend could change any moment. There are various chart patterns and range from simple to more advanced patterns. A trader should endeavour to be constantly learning and absorbing new ideas. Getting to know as many charts patterns as possible will help to make a trader better at trading. Only a few chart patterns are covered here, but these are some of the most identifiable and effective to use. Remember, use these patterns in conjunction with other indicators, data releases, etc. and make sure all are in agreement to give a higher probability of a successful trade. 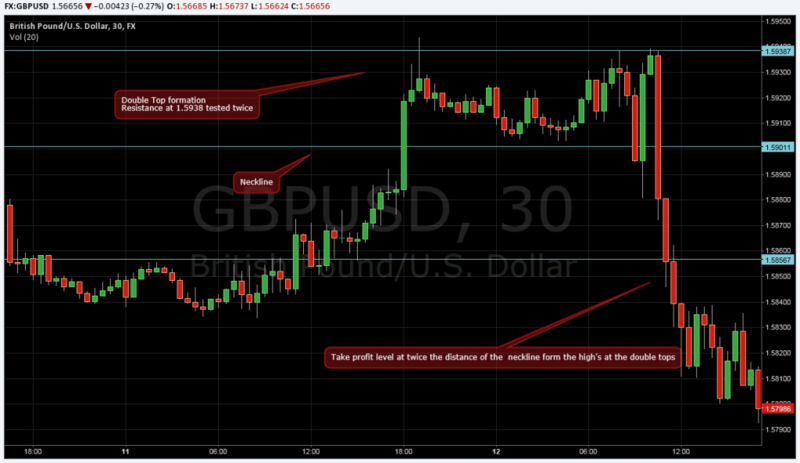 One chart pattern that is frequently observed is the double top, shown in the chart below for the GBP-USD rate. 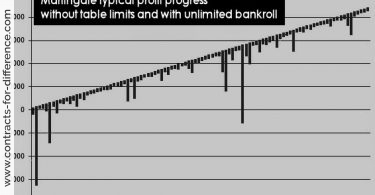 A double top occurs when the price tests a certain level twice and is found in an uptrend. The double top formation consists of a neckline and two high points. This chart pattern is a bearish reversal pattern. 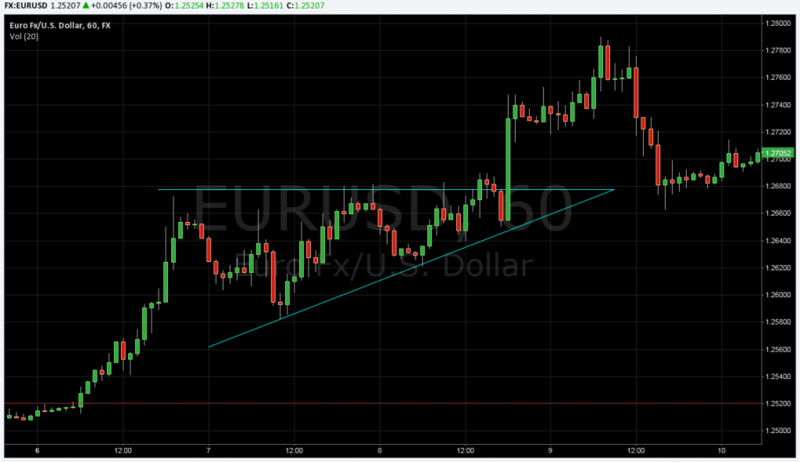 The neckline is useful for gauging how far price will fall after establishing a second high. The price will fall twice the distance between the high and the neckline. 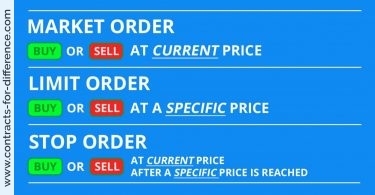 The example in the chart below shows that the price fell by more than that distance. After observing a double top, a trader would want to enter a short position with CFD contracts. Identification of this chart pattern would have led to a profitable trade. Double bottoms also occur, being the reverse of double tops. Double bottoms occur in a downtrend and are a bullish reversal pattern. Similarly, they have necklines and two low points. Traders could take advantage of this chart pattern by entering long positions with CFD contracts once the price has closed above the neckline after forming a second low point. Also, triple tops and triple bottoms are two other examples of chart patterns, being similar to double tops and double bottoms, but with three highs/lows instead of two. Another commonly used chart pattern is known as the ascending triangle, illustrated in the graph below. It is normally found in an uptrend and consists of a horizontal resistance line, which has been tested but not been broken and an upward trending line acting as support. The price is being squeezed inside the triangle and leads to a breakout. Ascending triangles give an indication of the direction of the breakout, with a very high probability of an upward move if one is found during an upward trend. Another simple chart pattern in known as the cup and handle, shown in the chart below. The cup pattern is self-explanatory, an arching movement of the price. 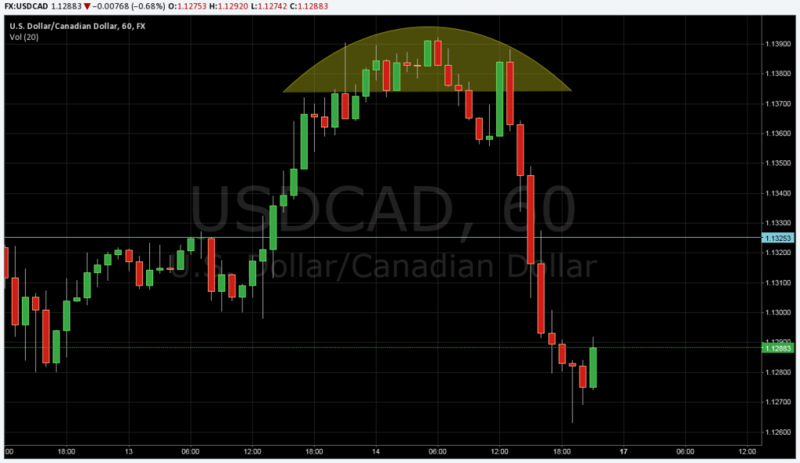 A cup and handle can be formed in any direction, the chart below shows a reverse cup and handle (upside down cup). A trade could be entered as the semi-circle is formed and then set a take profit at the base of the cup, shown by the horizontal line on the chart. The handle part moves in the upward direction for this example. For a normal cup and handle, the handle is the downward movement after the cup formation (U-shaped movement of the price). Rising or falling wedges are considered reversal patterns if they are found in rising or falling trend respectively. For example, the chart below shows a rising wedge formed during an uptrend. This would be considered a bearish reversal pattern and an investor should use short positions in CFDs to generate a return. 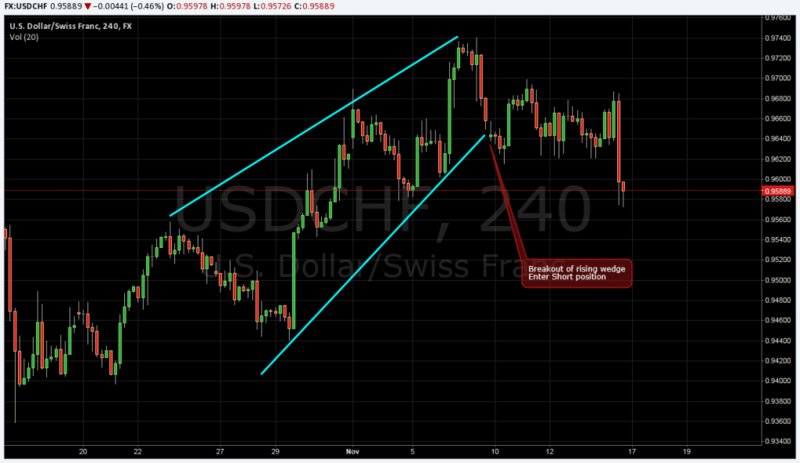 After the rising wedge was formed, the price moved lower for the USD-CHF pair and would have led to a successful trade. However, be careful when using wedges as chart patterns, as they only indicate a break out and could move out of the formation in either the downward or upward direction. Confirmation of a breakout is advised when looking to take advantage of these patterns. Notes: These are just some examples of chart patterns and many other chart patterns are used by traders to set-up trades. Remember, chart patterns can be very subjective and perfectly formed patterns are not always found. Therefore, traders should watch out for patterns and practise drawing using lines and curves to identify valid patterns that can be incorporated into trade ideas. Combining chart patterns with fundamental analysis and data releases strengthens the analysis and any trade ideas. Also, chart patterns on longer time frames give a higher probability of the market moving in the expected direction.